Modern Belltown with Amazing Views in every room! Suite Retreat have been hosting guests since 2006 with positive reviews and happy guests returning every year. Please look at our guest comments and book with confidence. We are dedicated to our vacation homes and satisfying each and every one of our guests. Luxury at its finest offers a corner unit with 2 bedrooms, 2 bathrooms, HUGE balcony,WIFI,indoor swimming pool, hot tub and last but not least, unobstructed Puget Sound breathtaking views from every room in the unit. We are located right in the heart of Downtown Seattle aka: Belltown, walking distance to fine dining, gourmet bakeries, and the best coffee shops (coffee capital). Cruise ship terminals is 3 blocks away. Modern elegance awaits you, luxurious bedding, gift basket with a map (for convenience), plasma TV, complimentary WIFI,washer/dryer, fully furnished kitchen with stainless steel appliances, and views*views*views. Make a cup of coffee, sit on the balcony and watch the ferry or cruise ships go by. It's truly amazing.... Even better yet, take a walk down to the Pike Place Market and get Northwest freshness.. Whip that up in the fully furnished gourmet kitchen. Never a dull moment in Belltown. A few blocks north you have the Seattle Space Needle and Fun Forest Amusement Park with the Jimmy Hendrix EMP (Experience Music Project) nearby...hop on the Monorail from there and it will take you to Westlake Shopping Center and the Pacific Place Mall for high fashion! A few blocks west of the condo are the cruise ship terminals and the Seattle 'trolley-cable cars' and take a stroll down on the boardwalk to the Seattle Aquarium and tons of unique shops! Take a ferry boat ride over to Blake Island and enjoy Tillicum Village or Bainbridge Island. Follow the boardwalk up the stairs and your at Seattle Pike Place Market while you're there, enjoy a sip of coffee at the original 'Starbucks' and watch the fisherman market staff throw a large fish across the display and catch it & bag it for you or drop it 'oops.' For the adults, there are live shows and tons of bars and clubbing all along 1st Ave. Go into Pioneer square and learn about the history of Seattle or take the Seattle Underground tour. Not too far from there is Chinatown. Catch a game at Safeco Field or Qwest Field. Don't forget, majority of downtown Seattle is a FREE bus ride zone so hop and off as you feel. Thanks for inquiring and enjoy your stay here with us! 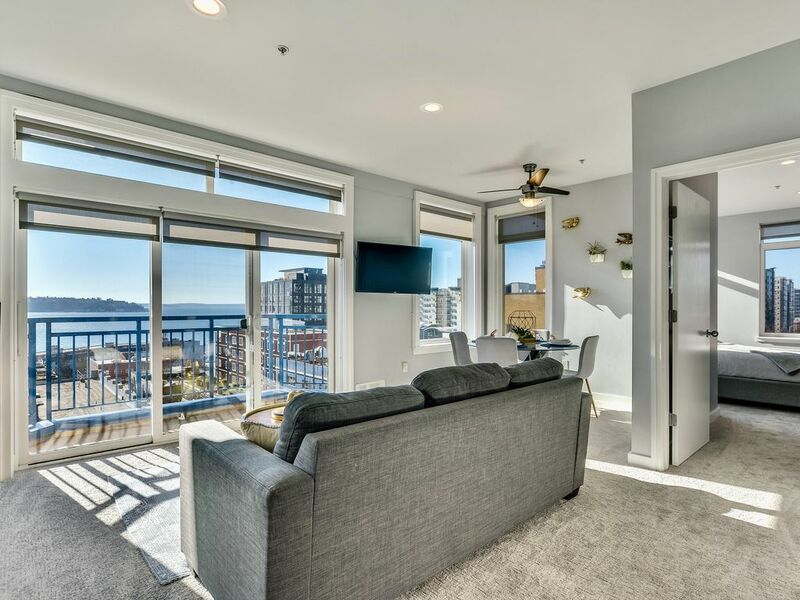 This corner unit has an amazing view in each and every room of the Puget Sound. The unit is fully furnished with washer and dryer. Great modern furnishing. Location~Location~LOCATION! Nothing beats living in the heart of Seattle with everything within walking distance. The city life is Great! Shops nearby, coffee shops right in the building and secure underground parking too! Stainless steel appliances overlooking views while cooking! Loved everything about this condo! Comfy beds, nicely designed, amazing water views, and a fully stocked kitchen. It’s in a great location too! The only negative was there were kids staying in the unit above us and they were running around pretty early in the morning. There was a lot of loud banging. Other than that, everything else was perfect!! From the ease of check in to the ease of getting to our activities...it was easy to get food at the market, pizza & pastries, walking and parking - everything to make a vacation feel like a vacation was exactly as we needed it from this location!! We loved our visit to this Modern Belltown property. The location couldn't have been more perfect being easy walking distance to the Space Needle, Pike Place Market, shopping, and loads of terrific restaurants and bakeries. The condo itself was exactly as promised. It's in a lovely secure building, had two nice sized queen bedrooms and a queen sofa bed, was very clean, and had fantastic views of the bay. We would definitely recommend and will visit again if we find ourselves in Seattle. Everything was great! The location was great and the views from every room was even better! The bakery at the bottom is very nice touch to get food and coffee! The apartment is very clean, all amenities are there, lovely views, nice large rooms. But the location, location, location couldn't be better. Dee greeted us and gave us an orientation of the space, pool, exercise room, and garage. The unit could be noisy for some people but we all slept well with and without our earplugs. All questions were answered promptly and during our visit, so that was nice. All in all we'd stay here again. The check in process was pleasant and easy. The pictures provided on the website are exactly how the place looks. We never needed to contact the owners for any problems.